Here’s a little story about myself and how I got into caricature drawing. In the early 1990’s I first started drawing caricatures in Whitby at the weekends. Whitby is a lovely place and was very busy at the weekends. I would set up a small stand with my examples and 3 chairs along with my prices. Back then I was only charging £3 a caricature! These caricatures would take only a minute or so to complete, but I was very popular and this is when I first thought I could make a career from being a caricature artist. I carried on working in Whitby for another year and I was doing ok but it was very quiet in the weekdays. A friend of mine suggested I should try York, he said it was busy all of the time. So I went to York to try it out. The first time I arrived in York I kept getting lost, the streets were very confusing and I didn’t know where the best spot would be to set up. The first street I tried was called Stonegate; it seemed a very popular and busy street. The first Saturday I tried I made double of what I was taking in Whitby! So I decided to move and live in York. I worked on Stonegate for a couple of more years, but then I applied for a street trading licence from York city council and moved to a different location called Low Petergate. I have now worked on this spot for the last 20 years drawing people from all around the world. I first started my online business in the early 2000’s; offering caricatures drawn from photos and offering my services for drawing live at Weddings and Corporate parties. 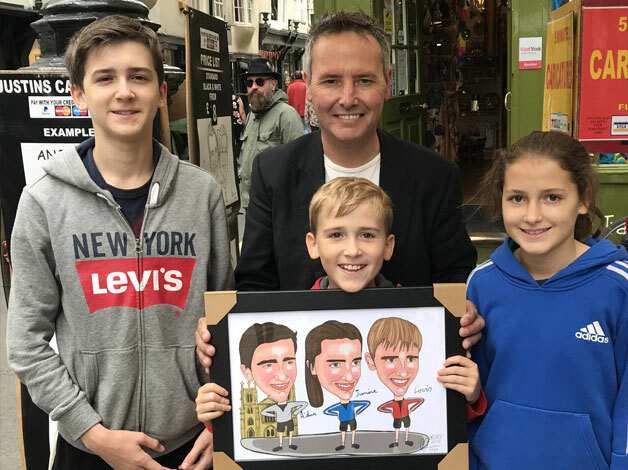 I have worked all over the UK drawing my live caricatures; I have worked for the BBC, Virgin and many well-known clients. I love my job and take great pride in providing the best service to my customers. All my customers love their caricatures they order from my site, and this really makes me happy to know I have made someone else happy from drawing my caricatures.